In addition to being AN‘s Midwest Editor, I was the special media correspondent for the Council on Tall Buildings and Urban Habitat in 2014, interviewing tall building designers, developers, and other experts at the skyscraper think tank’s Shanghai conference, and its annual CTBUH Awards ceremony in Chicago. The retrofit at the United Nations, seen in progress in 2012. 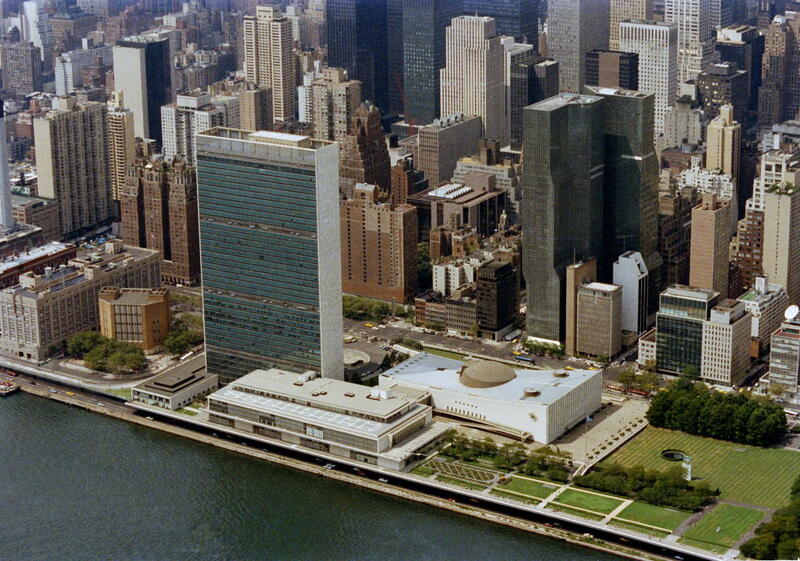 In Chicago I interviewed two of the minds behind the recent overhaul to the headquarters of the United Nations in New York City (technically, in an extraterritorial space contiguous with Midtown Manhattan). 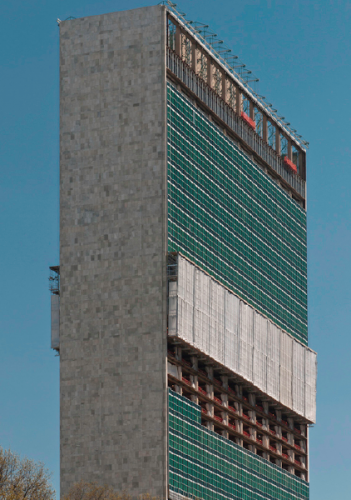 Michael Adlerstein, of the U.N. Capital Master Plan & John Gering, managing partner of design firm HLW International, discussed the retrofit of the 1953 United Nations Secretariat Building, a finalist in CTBUH’s 2014 awards. The handsome glass skyscraper exemplifies midcentury office design, drawing on the expertise of its architects, Le Corbusier, Oscar Niemeyer, and Wallace K. Harrison. But its outmoded performance standards left it in need of a serious update. In that sense the project to retrofit the building—which also included firms Heintges & Associates, Gardiner & Theobald, Skanska, and Rolf Jensen & Associates—is a case study for repurposing aging office buildings around the world. Michael Adlerstein (left), United Nations Capital Master Plan & John Gering, HLW International, discuss the retrofit of the United Nations Secretariat Building at the 2014 CTBUH Awards in Chicago.